It’s intimidating to put young children on a restricted diet. The GAPS diet is a highly nutrient-dense diet so they will be well nourished, so that isn’t the concern. But we live in abundance and our children are accustomed to eating things like pizza (even paleo pizza), crackers, sweetened desserts (even when sweetened with natural sweetners), and, as happened in my house last month, treats from classroom parties, get togethers, and other ‘special’ occasions that seem to happen nearly every other day. Yes. It bugs me that so our culture equates fun with junk food. The last part is why we’re doing a quick run through GAPS while the kids are home from school this week. We have lots of fun activities planned this week, and lots of soup to be consumed. We’re doing one stage a day from my intro book, and then I’m going to finish out the month on the full GAPS diet with a request that they not get extra food at school, but not stressing if they do. 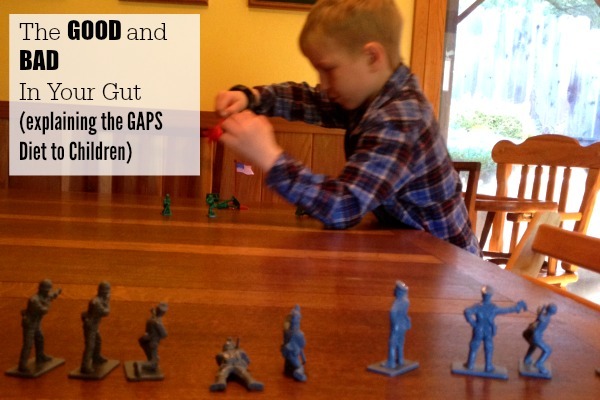 Most of my GAPS resources are about preschoolers and toddlers. Now that I’m doing it with olders who can understand explanations I wanted to share what I was doing so that you could use these explanations in your family. When I explain, I try really hard to use explanations that don’t belittle other people’s choices. We aren’t better or worse, we’re just different. In our family, we do GAPS to feel better. Other families make other choices, and I don’t want to have my children be impolite when they talk about GAPS. Have you heard of the term affluenza? We really are privileged in this country. We have thousands of choices of food products at the grocery store, and if we live in a city or suburb, it’s likely that there are 3-4 grocery stores within a couple miles. Our homes have climate control at the push of a button, and so do our cars. We drive on safe roads, and if we get a flat tire or our car breaks down, we call someone from the phone in our pocket (that also can access the internet!) and a professional with a big tow truck will come rescue us. We flush our waste down with clean water, and every Tuesday other waste is picked up right from the end of our driveway. And then take a look at the GAPS food. Homemade chicken stock, fresh organic vegetables. Sea salt to taste. Grass fed meat, cooked until it falls apart with your choice of dozens of veggies. Filtered water. As much fat as you want. Do you know where you can go out to eat and find soup with made-from-scratch broth, organic meats and veggies, salted with sea salt? That’s right: Only very high end restaurants. This food is not only highly nutritious, easy to make yourself, and not that expensive for how much nutrition it provides, but it is also what chefs serve their highest class patrons. Kids are going to complain. With all these choices that we have, and being accustomed to being shown what is newer/cooler/more than what they have anyway, most kids complain about something. Just because they’re complaining about GAPS doesn’t necessarily mean that they shouldn’t be on it. 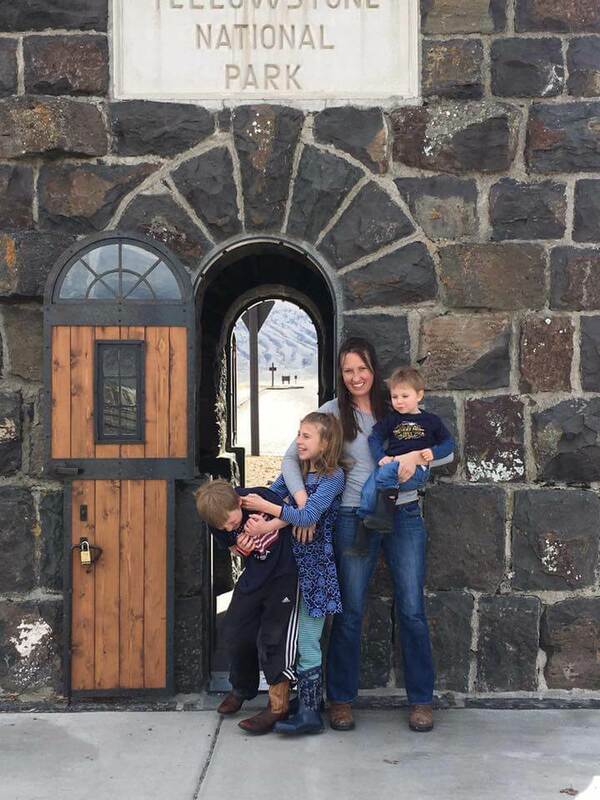 If you feel guilty for putting your kids on a restricted diet along with the rest of the family, you’ll want to deal with those issues yourself before doing GAPS. So, yes, “I hate GAPS!” may or may not have been heard at my house yesterday. But that’s not the end of the world. The day before there were complaints about not being able to go sledding in -9 degree weather. Again, complaints are going to happen. It’s part of having kids. In my experience, giving them what they think they want doesn’t prevent complaining from happening. Children lack the maturity to see things long-term. Some are naturally compliant and easily accept your explanation. Most become more compliant when their bad gut bugs are kept in check. Most will also complain to learn about their world – to see what your reaction is to complaining, to see what your answer is to their question, to check if you really mean it when you say they’re having soup for breakfast. Now this isn’t to say that everyone needs to be on GAPS (they don’t), it’s just to say that if you decide to put your family on GAPS for 5 days to boost their immune system after holiday indulgence, for 30 days to see if it heals a chronic condition, or for 2 years because they have autism or celiac, you are not depriving them. The opposite, in fact, you are giving them the gift of health! My 6-year-old LOVES playing army men with the neighbor boy 3 doors down. He watches Liberty’s Kids and acts out different scenes. He loves the good/bad part of gut flora. I told him that the bad gut bugs send signals to his brain that make him tired, grumpy, or sick. The good bugs help you to digest your food and get all the good stuff out of them so that you can run faster, learn more in school, and have more fun playing with friends. 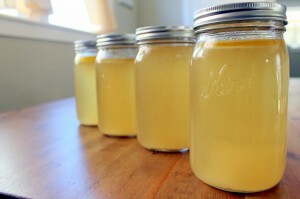 Chicken stock is super easy to make and is a powerful way to get nutrition. Delicious too! Chicken stock contains the fats, proteins, and trace minerals needed to help your gut seal up against bad bugs. When you drink this, you’ll heal faster, and your body will better be able to protect you against the bad guys. Sugar and additives in junk foods make your good guys work extra hard because they feed the bad guys. This is okay if you have a bunch of good bugs in your gut and just a few bad ones, but if you already have a lot of bad bugs, this will make your body and brain feel sick. When you go through intro using my e-book, children can easily see what they can eat the next day. They look forward to the new things. When they ask for something that they can’t have now on this stage, just tell them they can have it in 2 days/2 weeks/another time (chips, non-GAPS food). This was my main strategy when we started GAPS with a 3 and 1 year old three years ago. Don’t spend the whole time you’re on intro in the kitchen and house! Invest in a crockpot or two, and have a lots of GAPS food ready (you may be surprised how much your kids eat once they’re getting the nutrients in a form that their body needs), pack in thermoses, and then get outside. Go to the children’s museum. The pottery painting place, the thrift store, on a hike, on a long bike ride, whatever your family likes to do. Go anywhere where there isn’t food. The movies might be an issue if they’re used to getting popcorn or candy, but wouldn’t be a problem if you don’t get that normally. Great stuff! I am slowly catching on to the idea that my hubby taught me…phrase your statements in the positive instead of the negative! Like you said, “You can have it next week,” or what I’ve been saying repeatedly, “Yes, I like that food too, that’s on stage 6…We get to enjoy it then.” I think our culture has developed bad habits due to our fast food society and demand for immediate gratification. I am amazed at how well my kids have done on intro as long as I am consistent with them. Their “will power,” or self control (or maybe ability to look forward) has exceeded my expectations. Now that they are getting such good nutrition, I think the cravings aren’t as bad as they used to be either. It’s really up to us parents to only offer them healthy choices at an age when they are not capable of choosing what’s best for themselves yet. I find it amazing that our culture considers it deprivation for parents to restrict diet choices, yet we would be turned in to CPS if we offered guns or poison to our children to play with, because that would be irresponsible, right? Why can’t we see that letting them eat all these pounds of processed sugar and non-food items will kill them also…just more slowly. I get comments all the time about how my dietary restrictions will backfire on me and that when my children are older they will just rebel and eat everything that I have been depriving of them right now. All I can say is that may be true, but at least I can say I gave them a fighting chance at health by providing nutritious food to them in their developing years. Plus, I am confident that as long as I am teaching them through it and showing them how to cook for themselves, even if they depart from it for whatever reason, they will still know how to come back to it and do what they need to do to achieve healing if they want to make that choice later. Thanks for your help, Cara!